I am taking on a new job. This took a lot of soul-searching, because the East Baton Rouge Parish Animal Control Center is a fine agency, and I feel a great deal of loyalty to the animal shelter itself, to my boss, to our veterinarian and to my co-workers. I am leaving some of the finest people I have ever worked with in my life, but I am moving on to work with some equally fine people. I have been offered a job as director of operations for LA/SPCA in New Orleans, and I have accepted, but not for the salary increase alone. There are much deeper forces at work here. Hurricane Katrina has irrevocably changed something inside me. The day I watched New Orleans drown was the most horrifying and shocking day of my life -- more awful than 9-11. I grew up in New Orleans, and, when I was old enough to go to college, I wanted to get out and stay out, as young people often do. In order to become yourself, you usually have to get both physically and spiritually away from your roots. But watching New Orleans drown, watching fires within the flood, working in the animal rescue efforts after Katrina, hearing tales of survival, witnessing parts of the ghastly aftermath firsthand, and being a small part of the vast effort to rescue animals and reclaim my hometown ... all of these things have flipped a switch inside me. And just as a vagabond youth comes rushing home when news arrives that a loved one is at death's door, so do I feel compelled to be directly involved in picking up what is left of my hometown and trying to breathe new life into it. It's like giving blood, or even a kidney, to a loved one whose life is on the line. There is no explanation for the motivation to do so. You just have to do it. This is going to be a tremendous challenge. During the three days before Hurricane Katrina hit, the LA/SPCA evacuated all of the animals from their landmark shelter at 1319 Japonica Street, in the heart of the flood-ravaged Ninth Ward. But that shelter is now completely unsalvagable. 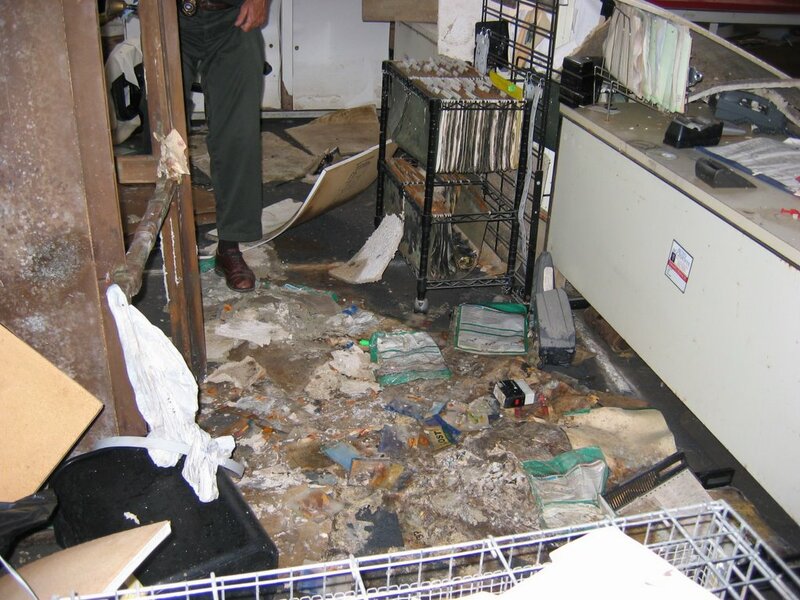 Below you will see a photo of the ruined SPCA lobby after the floodwater was drained. Bad enough, I suppose, but this isn't the worst part by a long shot. It actually doesn't look so bad compared to the rest of the building. We couldn't even get into some other parts of the building. The new shelter will be constructed directly across the Mississippi River from downtown New Orleans, in an area which does not flood. We get to transform an old coffee warehouse, with half a roof and no plumbing except for a toilet and washstand, into an animal shelter. We get to live and work in FEMA trailers while we do it. And we need to do this within the next two years. After that, there are long-term plans for LA/SPCA to build a regional shelter, inland, high and dry. This shelter will also serve as a regional emergency preparedness center for animal evacuees during future hurricanes or floods. It is extremely likely that this regional shelter will be in, or very near, Baton Rouge. This shelter will be able to serve the entire region. Like Lou Reed said, "It's the beginning of a great adventure." I won't be moving to New Orleans. I will be commuting. Some of my friends and co-workers see my new job as a well-deserved promotion, some folks think I am insane to even consider commuting, some people are just plain happy for me, and a few think I am quite mad to accept a job "patching up the Titanic." But to me, New Orleans is not the Titanic. I may choose to live in Baton Rouge, but New Orleans is home, and I cannot stand by without attempting to revive it. And if it were not for the lessons I learned as a child from my family and from the example set by the good people of 1319 Japonica Street, I might not be doing what I am doing today. This is a chance to close the circle and pay back with thanks. And so that is my news. It's almost time to send those cage cozies. 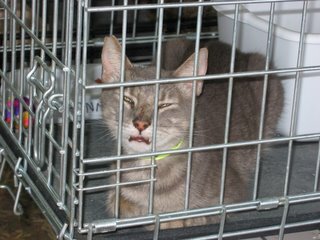 The warehouse is being repaired and renovated into a permanent animal shelter, but at the same time, it is being used as an emergency shelter. As yet, there is no climate control. This building promises a chill, damp winter for the animals. 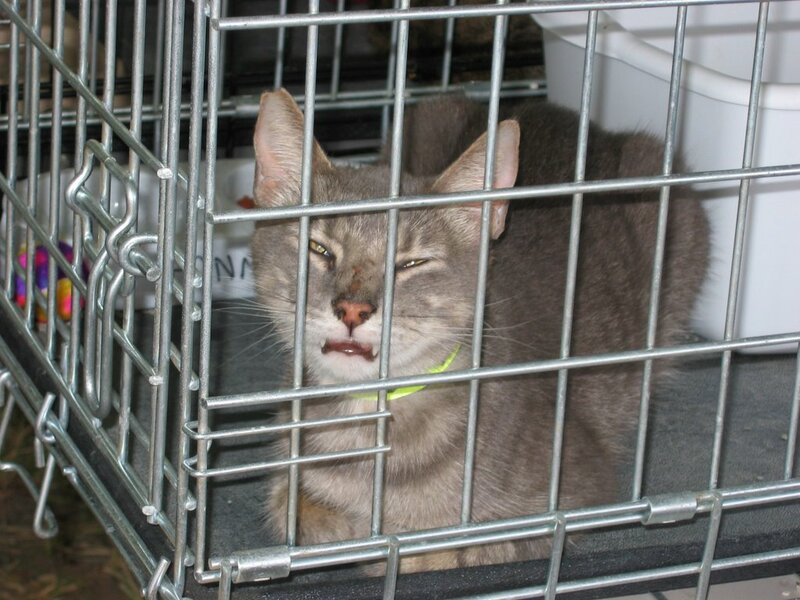 Cage cozies are needed in both 18" by 18" size for cats and small dogs and in baby blanket size for larger pets. Gather up those cozies you have been making and in the next few days I will be able to post maling instructions. My hiding place is making a bit of progress. I have discovered that I can fit a considerable portion of my stash into this little space, along with my spinning wheel, a stool, a small mattress, and a bunch of pillows. A progress report is forthcoming. Several shawls are finishing themselves at the same time. Don't ask me how this happened, but it is a very good thing, because I have only six inches done on the alpaca lace vest I am making Mom for Christmas. Photos of FOs and WIPs should be coming soon. Now I have to get busy untangling myself from my current job and getting ready for my new one. Congratulatons! You are the perfect person for this job. Be sure and take some time for yourself as well. I've already told you how pleased I am and proud of you that you are stepping up to this new challenge. You are in my thoughts and prayers as you "rough it" through this winter. CONGRATULATIONS on making the decision! Believe me if it werent for the fact that I moved on aug 29th to a new home, i would have been on the next plane i could have gotten down there. once i get thru my christmas knitting, i will start on critter cozies. i know what a damp louisiana winter can feel like and want those animals to feel warm and loved! best of luck in your transition and also to your husband for letting you take the job!